In my last post I discussed the challenge of finding the right kind of spaces where ambient and non-dancefloor music can be properly appreciated. 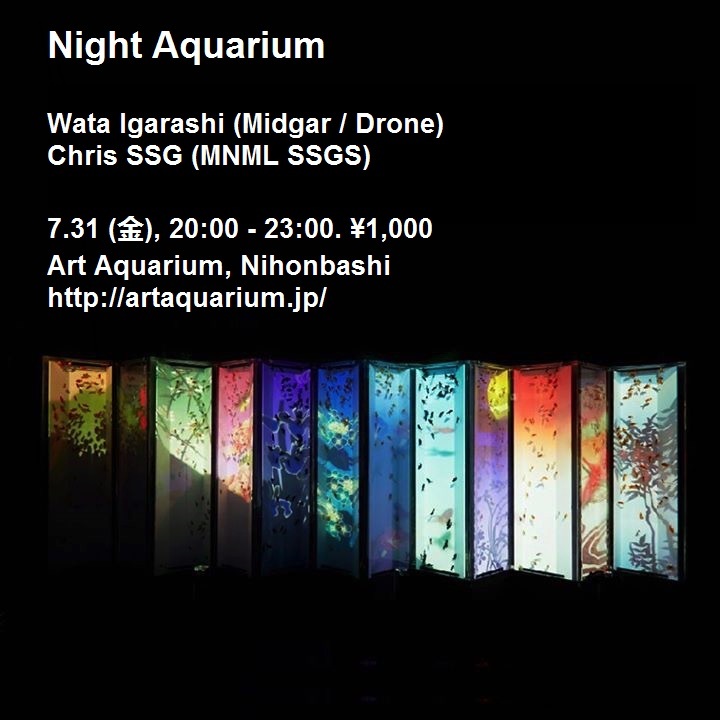 Related to this topic, I am very excited to be playing again this year at Art Aquarium Nihonbashi. This is exactly kind of the environment I love to play in, and I really wish there were more opportunities like this. Art Aquarium is made up of thousands of Japanese gold fish presented in an environment that combines traditional summer themes with trippy lighting and visuals. It really is a very beautiful and relaxing space, perfect for playing ambient and deeper psychedelic stuff. It was a pleasure playing last year, and again I am preparing something special. I am planning on taking full advantage of being able to DJ in a space like this. Expect lots of beautiful and blissful sounds. This is going to be fun. I am DJing from 20:00 – 21:30, and then my good friend Wata Igarashi – who composes all the music for the installation – will be playing until 23:00.